Game of Thrones is finally coming to an end of HBO after 8 seasons. People are coping with it in various ways. Some are really excited to know who gets to claim the crown. Others are nervous that the White Walkers are going to pull off their march. Some people might not watch until right before the final episode airs so they can watch all six in a row. There will be various ways for viewers to cope with the finality of a show they’ve been addicted to since 2011. The same could be true about so many of the cast members whose characters have remarkably survived this long in a show notorious for killing off fan favorites. Then Came You stars Maise Williams best known as Arya Stark on Game. She plays a character that has to cope with a different kind of finality. Deep in the heart of Albany, Skye Elizabeth Aitken (Maise Williams) and Calvin Lewis (Hugo‘s Asa Butterfield) meet in a cancer support group. During an exercise about things to do before your dead, Skye lets Calvin know that he should skip the trip to Disney World and other usual choices. She has a far superior list of things to check off with dozens of experiences from the simple to the bizarre to slightly criminal and finally sweet. She gets Calvin to help her check off a lot which he reluctantly does. The thing is Calvin is hiding a major secret from her, but gets too involved to admit things. His relationship with Skye makes him fearful to admit anything. There’s plenty of familiar faces as supporting characters. David Koechner (Anchorman) is Calvin’s dad who hooked him up with a job as a baggage handler at the airport. Tyler Hoechlin (MTV’s Teen Wolf) is the brother who wishes Calvin would enjoy life more. Nina Dobrev (Vampire Diaries) is the stewardess that Calvin has a crush on. Tituss Burgess (The Unbreakable Kimmy Schmidt) isn’t sure what to make of his fellow stewardess and the baggage handler. Finally there’s a comic turn by Ken Jeong (The Hangover) as a cop who recognizes Calvin and Skye from the cancer support group that his father attends. He’s constantly helping out the kids and being very understanding when things might not be that way. Then Came You deals with a delicate subject with a level of comedy without losing grip that part of this journey isn’t a humorous one. That there’s a hard reason for Skye’s big checklist that must get finished. Part of what keeps things from losing grip is Maise Williams’ performance. She’s proves she can do more than use a checklist to kill everyone that betrayed the Starks. Then Came You is a film with just the right amount of laugh and tears. The video is 1.85:1 anamorphic. The resolution allows you to take in the gentle views of Albany, New York. The audio is 5.1 DTS MA Surround. There’s also the 2.0 DTS-HD MA Stereo is you don’t have speakers all over the room. The movie is subtitled in English. Learning to Live (20:24) is a glimpse behind the scenes. The cast and crew discuss the emotional elements of the story. The actors talk of how the script made them want to make the film happen. Theatrical Trailer (2:25) lets the viewers know the film has comedic moments in a serious situation. Shout! Factory presents Then Came You. Directed by Peter Hutchings. Screenplay by: Fergal Rock. 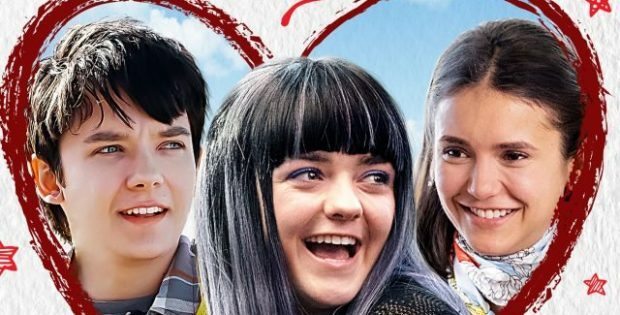 Starring: Asa Butterfield, Maisie Williams, Nina Dobrev and Ken Jeong. Rated: Not Rated. Running Time: 97 minutes. Released: March 5, 2019.